LodgingOur Alaska-style cabins are comfortable with all the amenities you’ll need to relax during your stay with us. 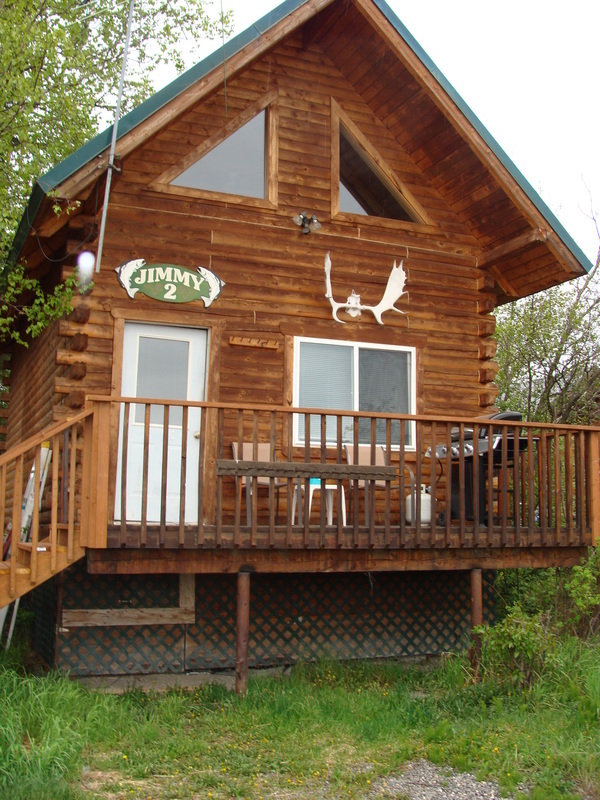 Our cabins are conveniently located on a waterway to the Kenai River where you can view wildlife, waterfowl, eagles and moose. Upstairs you will find a loft with sleeping quarters. Clean sheets, pillows and warm comforters are provided. Each cabin contains a full kitchen including stove, oven, refrigerator, cooking and serving utensils. For a quick snack, there is also a microwave oven. We provide plenty of paper towels and cleaning supplies. We also have daily cleaning support staff upon your request. You will also find an assortment of spices kindly left behind by previous guests. Outside on the deck, we provide a gas grill for your convenience and there is a dinette with seating for 4. Dinner trays are provided for extra guests. The living area is roomy, and for entertainment we provide satellite television. Before retiring for the night, you can relax on the couch, watch a movie and snack on microwave popcorn. Or, you can exchange stories with your friends in anticipation of the next day of fishing. Each cabin has dozens of photos of past and present clients with catches and Alaska memorabilia. We take great pride in making sure your stay is as cozy as possible. Because you’ll be so far away from during your stay, our cabins are filled with creature comforts. Each cabin is spacious and quiet. We provide you with a great lodging experience along with some of the most beautiful views to enjoy. Something so many of our clients enjoy is the quiet area surrounding our cabins. They’re quite clean, comfortable after a full day of catching some mighty big fish. Contact us today for details on booking your next fishing adventure.